Anda Masih Bingung Mendapatkan Partner Anda dalam Penyelenggaraan Kegiatan Outing/Gathering? Berpetualang di Kawasan Halimun, Baduy Luar dan Pelabuhan Ratu? 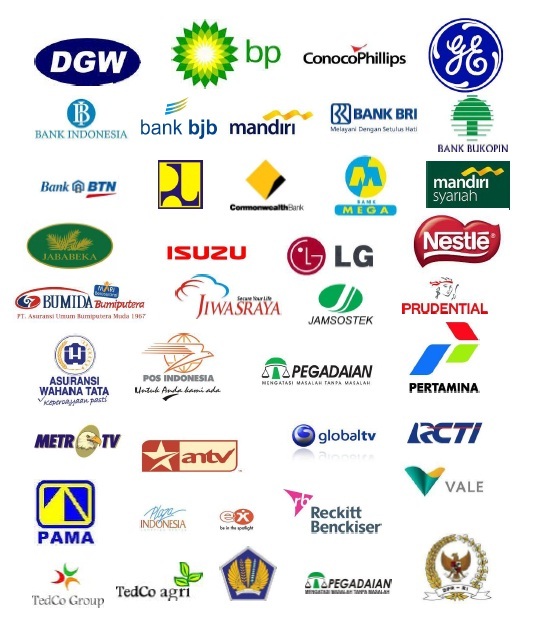 SEBAGAI TEMPAT BAGI KEGIATAN OUTING/GATHERING/OUTBOUND/MEETING/BERLIBUR ? ARUNG JERAM CITARIK memang sebuah lokasi yang menarik, unik dan menantang. MAU PROMO DAHSYAT *) UNTUK BERMAIN ARUNG JERAM DI CITARIK ? 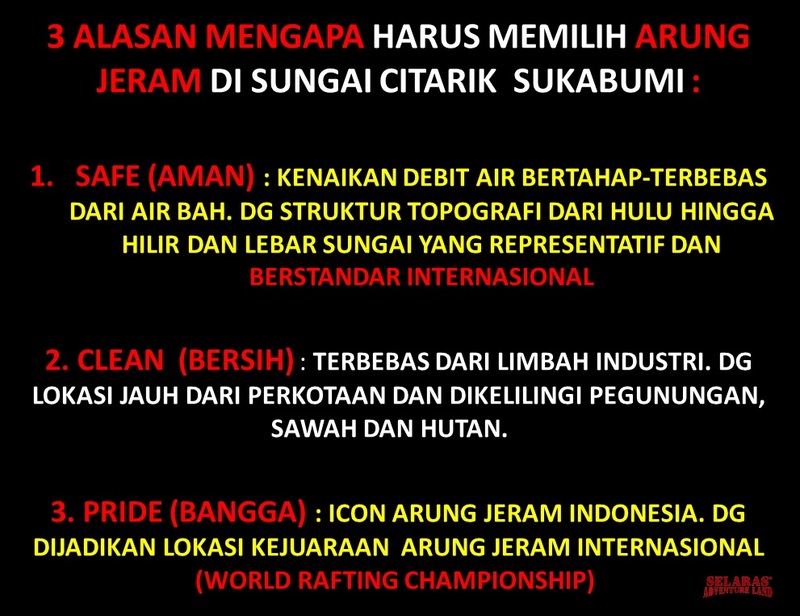 ATAU ANDA MAU PILIH PAKET-PAKET ARUNG JERAM CITARIK YANG LAIN ? Min. : 10 persons, Paint Ball Equipment, Semi automatic Gun, 30 Bullets, Insurance. Min. 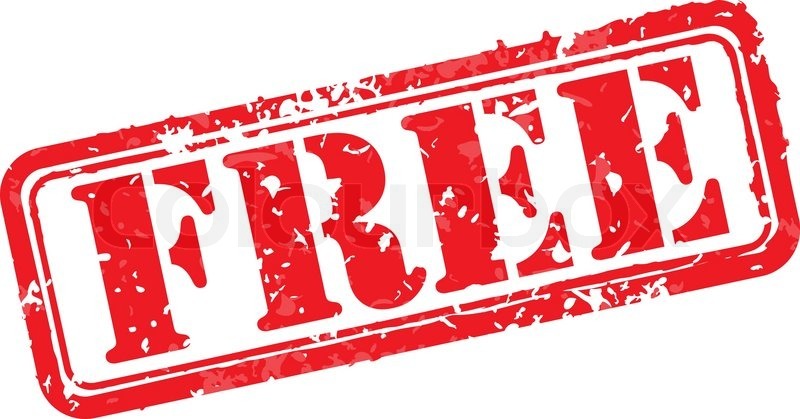 : 10 persons, Archery Equipment, 2x20 Minutes, Insurance. Including : 05 km Rafting, Archery Battle Combat, 1 x Lunch, 1 x Snack, Welcome drink, Fresh Coconut, Soft Games, Local Transport, Insurance. Including : 05 km Rafting, Accommodation 1 night, 2 x Meals, 1 x Snack, Welcome drink, Fresh Coconut, Soft Games, local Transport, Insurance. Including : 05 km Rafting, Paintball, Accommodation 1 night, 3 x Meals, 2 x Snack, Welcome drink, Fresh Coconut, Soft Games, local Transport, Insurance. Including : 09 km Rafting, Paintball, Accommodation 1 night, 3 x Meals , 2 x Snack, Welcome drink, Fresh Coconut, Soft Games, Local Transport, Insurance. Including : 05 km Rafting, Paintball, Flying Fox, Accommodation 1 night, 3 x Meals, 2 x Snack, Welcome drink, Fresh Coconut, Soft Games, Local Transport, Insurance. 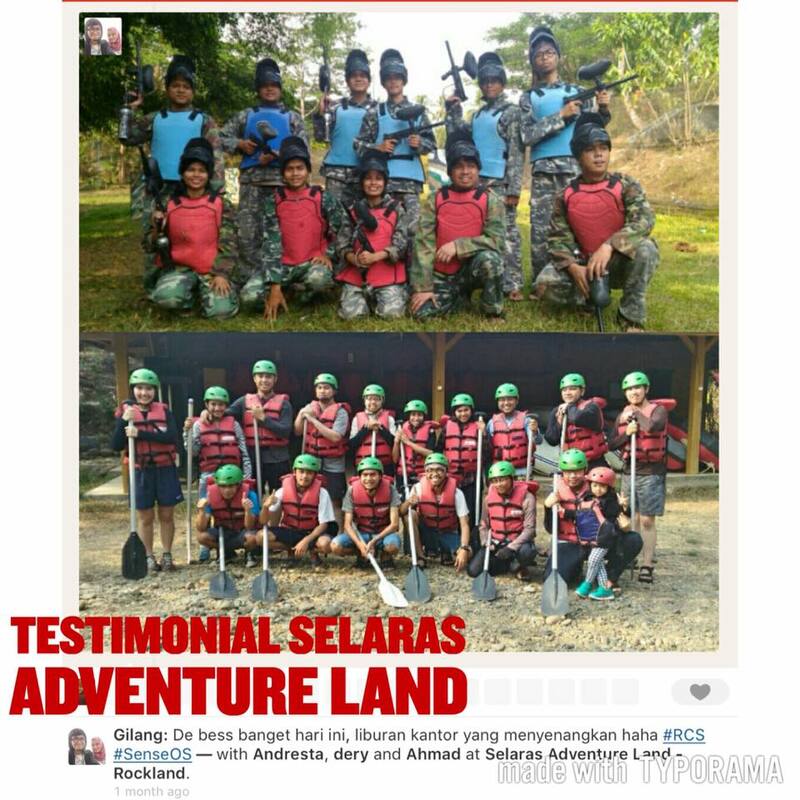 Including : 09 km Rafting, Paintball, Flying Fox, Accommodation 1 night, 3 x Meals, 2 x Snack, Welcome drink, Fresh Coconut, Games, Local Transport, Insurance. Including : 05 km Rafting, Wisata ke Curug Sentral, 1 x Lunch, 1 x Snack, Welcome drink, Fresh Coconut, Local Transport, Insurance. Including : 05 km Rafting, Wisata ke Curug Sentral, 1 x Lunch, 1 x Snack, Welcome drink, Fresh Coconut, Mineral Water, 1 Night Accommodation (Traditional Cottage/Tent), Local Transport, Insurance. Including : 05 km Rafting, Archery Battle, Wisata ke Curug Sentral, 3 x Meals, 2 x Snack, Welcome drink, Fresh Coconut, Mineral Water, 1 Night Accommodation (Traditional Cottage/Tent), Local Transport, Insurance. 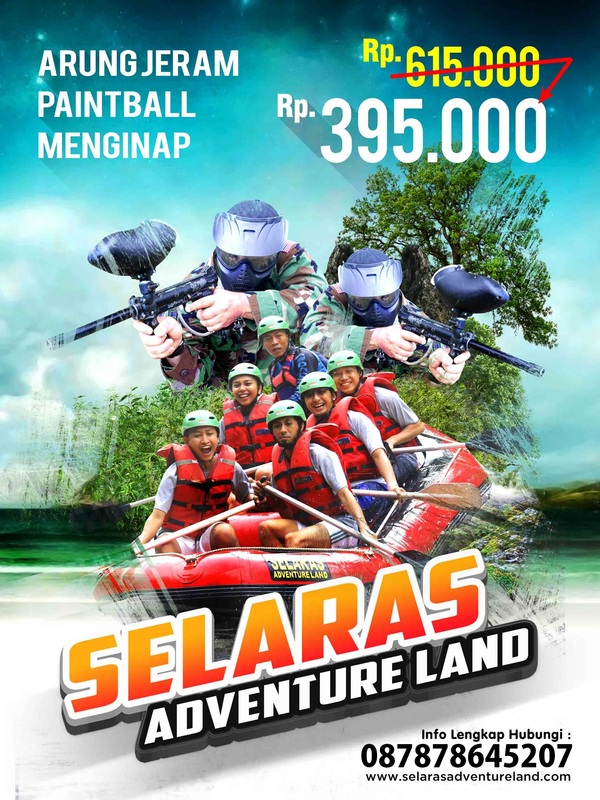 Including : 05 km Rafting, Paintball War Game, Wisata ke Curug Sentral, 3xMeals, 2x Snack, Welcome drink, Fresh Coconut, Mineral Water, 1 Night Accommodation (Traditional Cottage/Tent), Local Transport, Insurance. 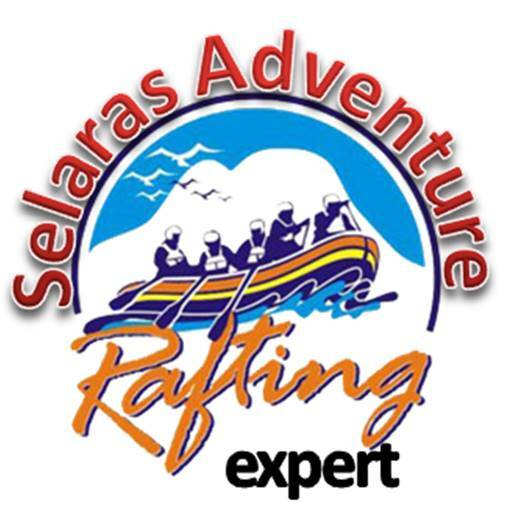 Including : 05 km Rafting, Wisata ke Curug Sentral, Fun Games, Camping, 3xMeals, 2x Snack, Welcome drink, Fresh Coconut, Mineral Water, Local Transport, Insurance. Including : 05 km Rafting, Wisata ke Kampung Baduy Ciptagelar, 3xMeals, 2x Snack, 1 Night Accommodation (@Traditional Baduy Houses), Welcome drink, Fresh Coconut, Mineral Water, Local Transport, Insurance. So, Enjoy Your Journey and Feel The Adventure Land Experience ! JANGAN TERJEBAK HARGA MURAH UNTUK KEGIATAN ARUNG JERAM, HARAP PERHATIKAN 3 FAKTOR UTAMA BERIKUT !